Our septic tank services are available anytime you need help troubleshooting and resolving concerns in Eustis. Septic Cleaning—Regular septic cleaning allows wastewater to flow freely away from your home or business and ensures the longevity of your entire septic system. When you have us clean your septic tank, we will perform a thorough and complete job. Septic Inspections —Sewer inspections are another effective and economical way to make sure your septic tank and other components are in good condition. Our technicians are trained and experienced to look for any septic issues that may prevent your system from working its best. Septic Tank Repair—If you have a septic tank problem, you shouldn’t wait to get it repaired. Luckily, our septic tank services are available anytime you need help troubleshooting and resolving these types of concerns. 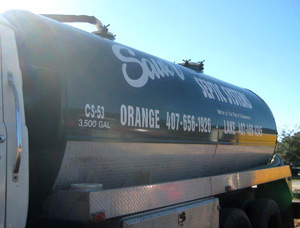 At Sauer Septic, we take pride in the fact that we have been serving the Eustis area for more than 30 years and are able to fully serve both residential and commercial clients. You will always receive excellent service from us when you have us clean or repair your septic tank, or provide you with any other septic tank services. We are confident that you’ll turn to us again and again for all of your septic needs.